The financial media was predicting the end of capitalism, the demise of America, etc. I remember it as a great buying opportunity, and in retrospect, despite their unpopularity, the bailouts were a success. The S&P 500 peaked at 1560 in 2007. 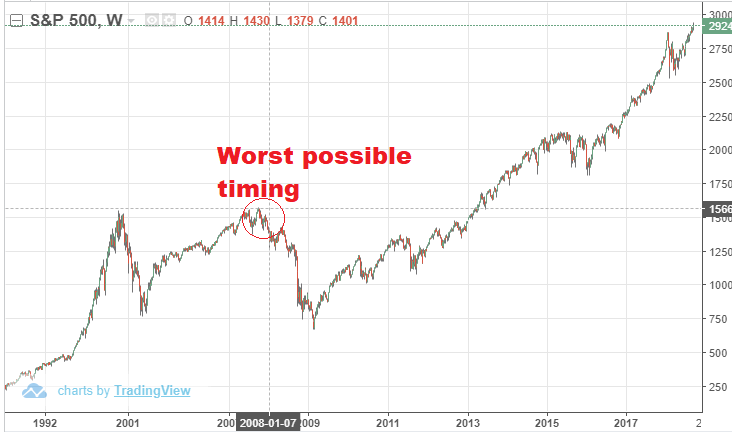 Now, just 11 years later, it’s at 2900, so even if you purchased right before the crash (the worst possible timing), had you held to today you would have made a whopping 86%. Including the generous 2% annual dividend yield of the S&P 500, and the gains explode to 130%, and that is in spite of the worst banking crisis and deepest bear market since the Great Depression. Who would have guessed the longest economic expansion and biggest bull market ever would have followed the 2008 crisis, which was so acute and bad. Just as the crisis was unforeseen, so too was the huge recovery. It goes to show how buy and hold and buy the dips (for U.S. indexes, not necessarily individual stocks) is a good strategy. You got to hold your nose, tune out the doom and gloom media, and buy (or at least not panic sell). A common complaint is that the bailouts only benefited Wall St., but everyone benefits, including the middle class and the poor, from having an economy that is not in free-fall. The crisis caused interest rates and bond yields to plunge, making the bailout effectively free, and it would have been foolhardy and imprudent to do nothing, because of ‘moral hazard’. Peter Schiff, Nasism Taleb, and other ‘experts’ predicted that the bailouts and QE would cause high inflation, yet the CPI 10 years later is still very low, around 2.8%. And the U.S. dollar has surged since 2008. Small, weak foreign economies do not have the luxury of being able to print money with impunity, due to inflation risk, but America and Japan are unique in that they have much more options, and that’s why Peter Schiff and others were wrong. Right now unemployment is only at 3.8%, and while that excludes those who are not looking for work and have ‘dropped out’, that is still very low, historically speaking. People who bought homes in 2005-2007, assuming they did not sell, are closer to breaking even or are even. Retirement accounts, 401ks, investment accounts, and so on, have gained substantially, which benefits many people, not just the wealthy. Compare that to Spain, Turkey, Brazil, Russia, Greece, and Japan (post 90′s), which are much worse shape and never fully recovered. But it’s not all roses. The labor market as measured by the labor force participation rate, has yet to recover and likely never will due to structural changes such as automation and IQ becoming more important. Millions are people, especially, middle-aged and older people who are too old to learn new skills or adapt to a rapidly changing economy, have dropped out, either retiring or going on disability. Also, many millennials are struggling with debt and poor job prospects, and are stuck paying rent at a rate that far exceeds inflation, instead of building long-term wealth through home ownership and investment (as their parents did). And, in spite of low CPI-based inflation, healthcare costs are out of control, and no one seems to know why or have any solution. Overall, high-IQ people and also rich people, especially those in STEM, fared the best in the aftermath of the crisis. Those without in-demand skills (such as coding) or high IQs (a high IQ is often necessary to learn such skills), have done worse. It’s not to say it has been a disaster, but the average, who make up the ‘fat middle’ of the Bell Curve, by in large, have not reaped the full extent of the gains in the post-2009 bull market in stocks, now officially the longest ever, or the post-2011 recovery in the housing market. A question that comes up often is, will there be another crisis similar to 2008? There could, but odds are there won’t. Despite the media hype that makes it seem like crisis is always around the corner, there have only been two financial/banking crisis in the U.S. the past 100 years: 1929 and 2008, so odds are none of us will live long enough to see a third one. 2008 was a banking crisis, not just a market correction. Banking crisis are a lot more rare than market corrections and recessions, which is a reason for optimism. Personally, I’m long tech stocks. Amazon, Facebook, Google, Microsoft. Ready to see Nasdaq 10k soon. The good news is is, the fed can easily lower rates back to 0% if things begin to look weak again, but I think the post-2009 expansion has a lot of gas left. Given how tame inflation is and the fed’s easy money polices, it may be a decade of longer until there is another recession and bear market. How about the canard that the fed is ‘propping up the stock market and economy.’ Again, such an argument fails upon closer inspection. Amazon, Google, Disney, Facebook, etc., which have nothing to do with banking, since 2009 have reported huge profits, growth, and demand for their products. Second, why is the market rising in spite of the fed ending QE and raising rates, because if the economy were dependent on those things, wouldn’t we be in a recession and a bear market. The fed Ended QE in October 2014 and began raising rates again in 2015, yet the S&P 500 has risen substantially since then.